Finely chop, press, or grate enough garlic to measure ½ teaspoon [1 tsp]. If using the jalapeño, remove the stem; thinly slice the jalapeño crosswise. Wash your hands after handling. In a small bowl, stir together the lime zest and juice, garlic, cilantro, half the fish sauce, and as much jalapeño as you like. Add more fish sauce to taste, if desired. Let stand while you prepare the rest of the meal. Pat the fish dry with a paper towel; season generously with salt and pepper. In a large frying pan over medium-high heat, warm 1 to 2 tablespoons oil until hot but not smoking. Working in batches if needed, add the fish (skin side down for the salmon) and cook until lightly browned (and the salmon skin is crisp), 4 to 5 minutes. Turn and cook until the flesh is opaque and flaky, 2 to 4 minutes. Transfer to a plate. Add more oil between batches if needed. While the fish cooks, prepare the slaw. Pat the trout dry with a paper towel; season lightly with salt and pepper. In a large frying pan over medium-high heat, warm 1 to 2 teaspoons oil until hot but not smoking. Working in batches if needed, add the trout, skin side down, and cook until the skin is browned and crisp, 2 to 4 minutes. Turn and cook until the flesh is opaque and flaky, 1 to 2 minutes. Transfer to a plate. Add more oil between batches if needed. While the trout cook, prepare the slaw. Cut the peach in half and remove the pit; thinly slice the fruit. Using the bottom of a bowl or cup, lightly crush the cashews. Grate or peel and finely chop enough ginger to measure 1 teaspoon [2 tsp]. Strip the mint leaves from the stems; coarsely chop the leaves. 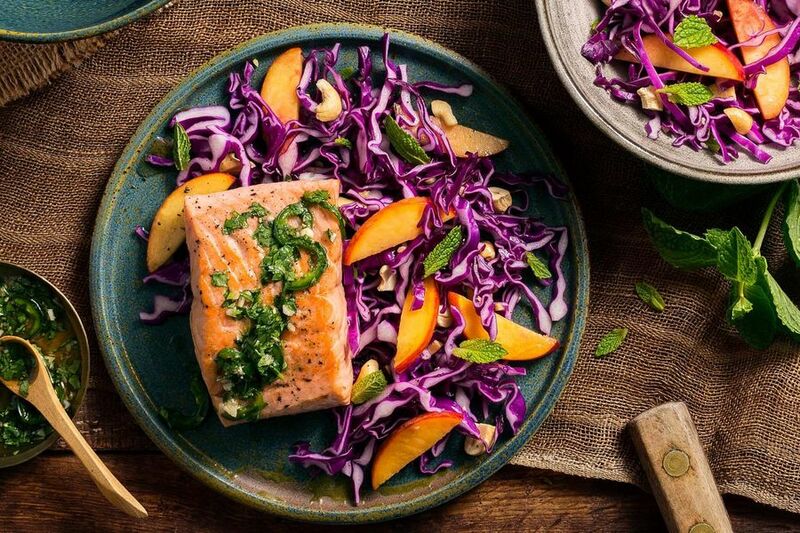 In a large bowl, toss together the peach, cashews, ginger, mint, cabbage, red wine vinegar, and 1 to 2 tablespoons oil. Season to taste with salt and pepper. Transfer the fish to individual plates and top with some of the cilantro-lime sauce. Serve the peach-cabbage slaw and any remaining sauce on the side. This Thai-inspired paleo dish features sweet peaches, which perfectly offset our tangy cilantro-lime sauce in a one-pan fish meal. Prepare a medium-hot fire in a grill. Set the fish on the grill directly over the heat (skin side down for the salmon and trout) and cook, turning once, until the fish is opaque and flaky (and the salmon or trout skin is crisp), about 5 minutes per side for the salmon or halibut, 4 minutes per side for the trout. Calories: 460, Protein: 39g (78% DV), Fiber: 5g (20% DV), Total Fat: 26g (40% DV), Monounsaturated Fat: 15g, Polyunsaturated Fat: 7g, Saturated Fat: 3.5g (18% DV), Cholesterol: 55mg (18% DV), Sodium: 900mg (38% DV), Carbohydrates: 26g (9% DV), Total Sugars: 12g, Added Sugars: 0g (0% DV).